Recognized as the top designation in Canada a CPESC® designation establishes and expands your credibility as an ESC practitioner. It combines many disciplines and specialties to help you produce plans and designs that comprehensively address current and potential erosion and sedimentation issues at sites. The practices and measures taught are cost-effective, understandable, and are intended to ensure that professionals meet ‘Qualified Personnel’ requirements. 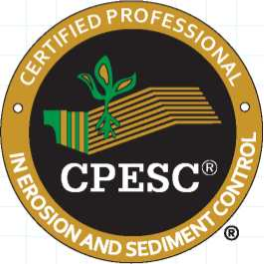 CPESC professionals develop the knowledge and experience to ensure that the projects they oversee meet local, provincial, territorial and federal environmental regulatory requirements. If you require a review guide please include the address you would like it couriered to. Review Course does not include Exam. ** Please do not make non-refundable travel arrangements until you receive a confirmation email that states the event has been confirmed. Fill out the PSI Form on the EnviroCert web page in the instructions (For instructions please click here.) Then the PSI Centre will contact you to book the exam (it may be available closer to you depends on how many register and what city/province people are from etc. ).